One of our five business values is to ‘Develop, value and respect our people’, which aligns with Valuing our Workforce. As part of celebrating the great work our team do, we have been recognised by regional, national and international peers for our innovative work through various award schemes. 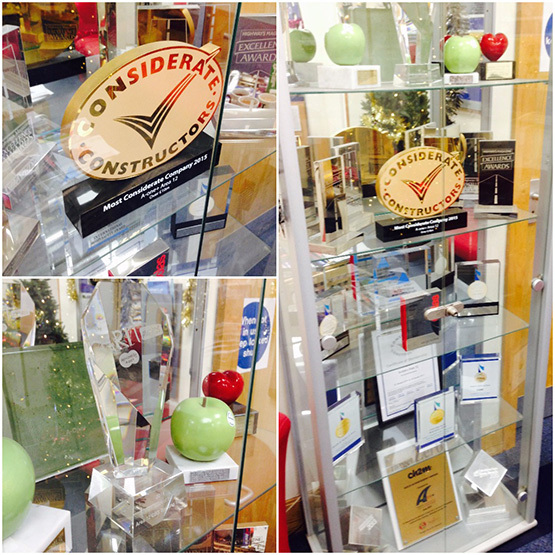 We have now installed an illuminated glass trophy cabinet in our main reception area housing the numerous industry awards and accolades that we have received. Our workers now pass this cabinet every day as they come to work, helping them feel proud about our business achievements and valued by the business. This is especially true as the teams who have received these recognitions are drawn from across the work disciplines within the business and across the themes of health and safety, innovation, sustainability and people. The trophy cabinet’s location in reception also provides clients, stakeholders and visitors from our community and opportunity to see and recognise our commitment to pushing industry boundaries. For our existing workers and new starters, the trophy cabinet provides inspiration and passion to push boundaries across construction, and confidence that the business is committed to supporting their endeavours.